Jenna Blogs: My husband, the loudmouth. 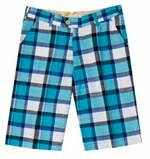 LoudMouth is a golf brand of apparel that was popularized recently by John Daly (whose a famous golfer from Arkansas). 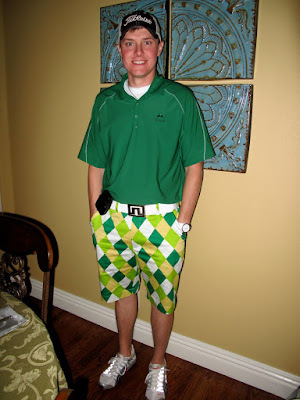 Chris was watching a tournament one day and John was wearing a pair of LoudMouth pants and he just had to know what they were. He's not afraid to stand out and he's been dying to get some ever since. I don't think the older golfers at his club are very happy about it, but he's getting a kick out of his new golf wardrobe. We met up at Chili's yesterday for lunch and the top picture in this post is what he was wearing. I forgot that is what he left the house in until it was too late. Chili's was packed and I think every single person in the restaurant turned to stare - and of course they put us in the very furthest corner of the place. 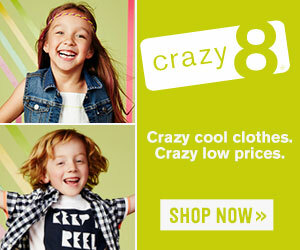 Have you seen these - or do you know anyone who wears them?